His father was Irish, his mother Russian-Jewish. He was a lackluster student at Maine Township High School in Park Ridge Illinois (no athletic star, never above a C average). After dropping out of Ripon College in Wisconsin, where he did some acting and later summer stock, he signed a Hollywood contract with Columbia and later Universal. His roles in movies and TV ( "Ironside" (1967), "The Virginian" (1962)) remained secondary and, discouraged, he turned to a career in professional carpentry. He came back big four years later, however, as Bob Falfa in American Graffiti (1973). Four years after that he hit colossal with the role of Han Solo in Star Wars (1977). Another four years and Ford was (words fail) Indiana Jones in Raiders of the Lost Ark (1981). Still another four years and he received Academy Award and Golden Globe nominations for his role as John Book in Witness (1985). All he managed four years after that was his third starring success as Indiana Jones; in fact, many of his earlier successful roles led to sequels as did his more recent portrayal of Jack Ryan in Patriot Games (1992). Another Golden Globe nomination came his way for the part of Dr. Richard Kimble in The Fugitive (1993). He is clearly a well- established Hollywood superstar. He also maintains an 800-acre ranch in Jackson Hole, Wyoming. He served a long apprenticeship in film and television, interspersed with employment as a carpenter, before achieving stardom in Star Wars (1977) and its two sequels. 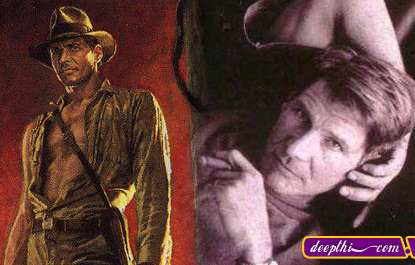 Cast as a resourceful, swashbuckling hero, he found great popularity as the archaeologist adventurer �Indiana Jones� in a series of films beginning with Raiders of the Lost Ark (1981). He enhanced his reputation with testing characterizations in Witness (1985, Oscar nomination), The Mosquito Coast (1986), Presumed Innocent (1990), and The Fugitive (1993). Later films include Clear and Present Danger (1994), The Devil's Own (1997), and What Lies Beneath (2000). He received the American Film Institute's Life Achievement Award in 2000.